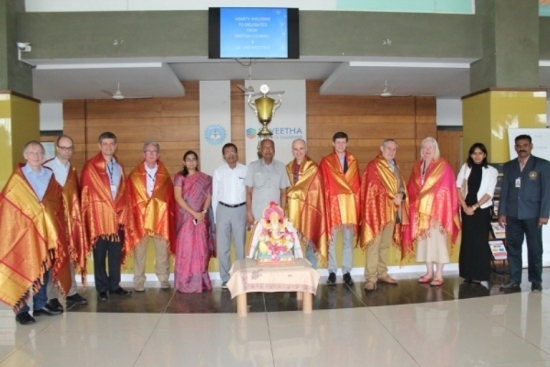 Delegates from eight different universities of UK had visited Saveetha School of Engineering along with delegates from British Council on 27 January 2017. The agenda of their visit is to conduct seminar for engineering students on various advanced research topics and also to discuss about possible MOU between the universities. Following Points were discussed During the meet. ➢ Discussion on Student exchanges and short term visit- one semester abroad program (SAP). ➢ Faculty exchanges- Possible research collaboration, joint research proposals and exchange of visiting faculties between two universities. ➢ Possibility of Memorandum of Understanding (MOU) between both universities by signing written agreement. ➢ Conducting workshops and conferences- Joint collaboration. ➢ Postdoc opportunity for faculty members in UK universities with funding. The Students of Saveetha School of Engineering were very much happy about their exposure to emerging trends in the industry. Disclaimer: The information provided in this Notification is solely by Saveetha School of Engineering., Jagranjosh.com bears no representations or warranties of any kind, express or implied, about the completeness, accuracy, reliability, suitability or availability with respect to the information. Individuals are therefore suggested to check the authenticity of the information.